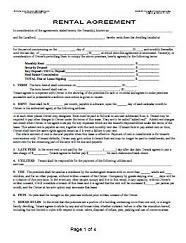 The Rental Agreement with lots of Landlord Protection. If you want a Rental Agreement with Lots of Landlord Protection, and is not too intimidating to the tenant, The LPA Rental Agreement may be just what you are looking for. Our State Specific Lease Index, quickly and easily allows you to use The LPA Rental Agreement for any state. The LPA Rental Agreement is a residential lease designed for landlord who wants to have an easy lease signing with a new tenant. Although it contains many of the key "landlord protection" legal elements that the LPA Lease contains, it is not quite as detailed. You may consider it a Quicker version of the LPA Lease. And since it is in Microsoft Word format, you can easily customize the form by adding in clauses of your own, or some of your favorite "landlord protection" clauses from the LPA Lease! Whether you use it as it is, or make adjustments, the LPA Rental Agreement is a superior residential rental agreement. For even more detailed landlord protection, be sure to see the LPA Lease.